Elizabeth Burns: Va Va Vavoom! Like the photo I'm using on this page? 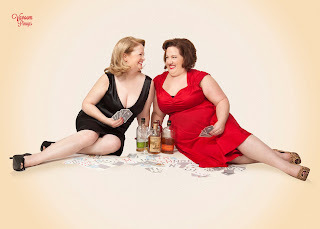 It's from this year's birthday present to me: I did a pinup photo shoot at Vavoom Pinups in Chicago. 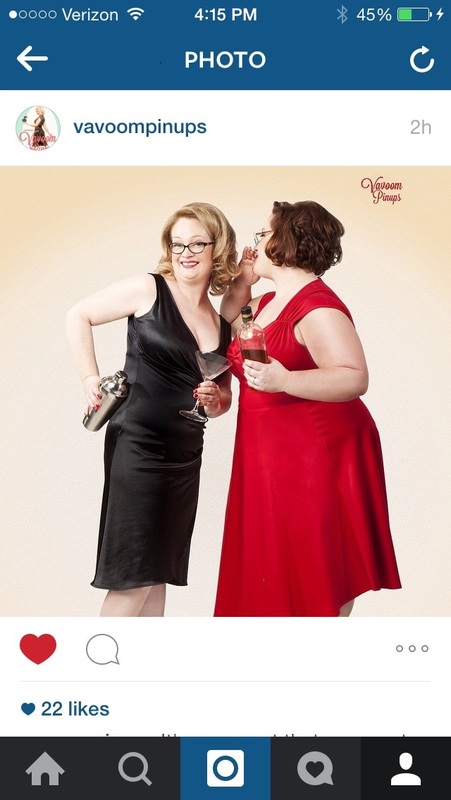 Vavoom Pinups is about "empowering vintage photography" and I can say that description? Is totally, a thousand percent true. I had heard about Vavoom Pinups from friends; I was wanting to do something for me. And I was thinking about my younger self, and how sometimes I just wanted to go back in time and say you look amazing, you're not fat, wear that bikini. And I can't go back in time, but I wondered, twenty years from now am I going to be saying the same thing? So forget the self doubt and all that.... and get my picture taken. I recommend the experience to anyone! It began with hair and makeup, and wow, it takes a while to look that good. No, seriously -- I had no clue that it would take as long as it did. I loved the results. Vavoom Pinups provides the clothes; and perfect fits don't matter because it's about the photos. So if there are gaps, are things that need to get pinned up, that's all fine because it's about looking right for the photo. One of the reasons the photo shoot was so fun was I didn't do it alone. Kelly Jensen of Book Riot and Stacked also got her photos taken -- and we had some taken together. It was a blast. It was so much fun, and it showed, that Vavoom Pinups used one of the photos on their Facebook and Instagram. Since I did this for my birthday, it only seems right to post about it on my actual birthday. This was my extravagant gift to myself: and I have no regrets. I love the photos; and I love the experience; and I can't wait until I'm in Chicago again and can do it again. I just love these pictures. You look so amazing and hot, and there's such wit to them. That's so awesome! I'm jealous! I want to go to Chicago with my sisters and have family photographs done. What a cool service, and your photos, of course, look amazing. I'm so glad I got to share this super fun experience with you. I don't know about you, but it really changed how I feel about myself and my looks. You rock, Liz. I've enjoyed seeing these pictures of you - you look great. Happy Birthday! Good for you, doing something fun! By the way, you look gorgeous! Happy, happy Birthday!